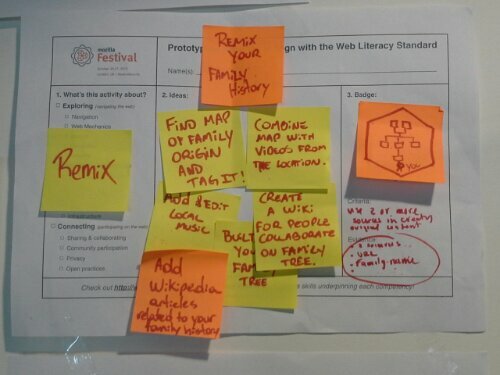 This weekend has been my first MozFest – my brain has been overloaded with cool new information and ideas. I think its safe to say I’m going to need to sleep on some of it before I can share my thoughts. 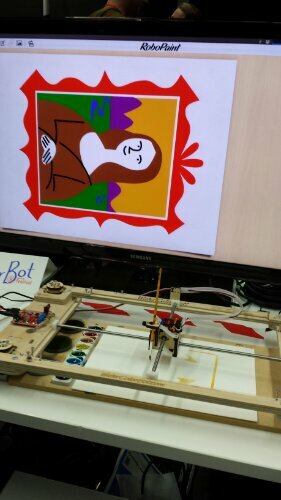 This is the Watercolorbot from Super Awesome Sylvia (@makersylvia). Sylvia is definitely deserving of her title, at 12 years old she has developed her own water colour painting robot and presented it at the White House Science Fair. I was never this cool or talented at 12. What I really like about this project is that it shows that anyone can be a maker if they put their mind to it – and that we should always encourage learners (of any age) to reach for the stars. I found this amongst a Web Literacy Standard display. Doug Belshaw (@dajbelshaw) had asked attendees to work up ideas for activities that aligned with the standard – and to match this to a minimum viable badge. I spotted this remix idea and loved it so much I had to take a photo. I like it so much because despite being a fairly able family when it comes to technology, we’ve never had an opportunity to collaborate online together – and this is such an interesting way to bring generations together. I also like the notion of enriching a family tree with information and multimedia that is relevant to family milestones. This is a prototype open badge from a wonderful display of over 100 badge ideas – an activity created by The Badge Maker Team . This particular badge from @urban_teacher really caught my attention. 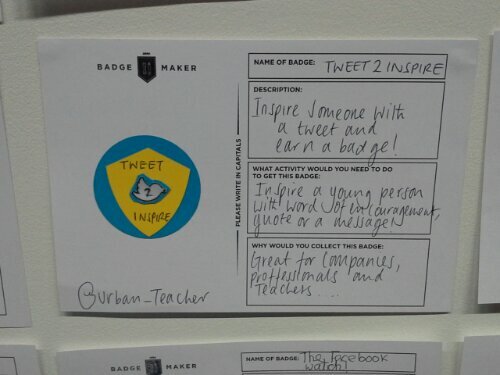 What I liked was how the badge encourages people to support learners through social media – my only tweak would be to add that it could be rewarded for inspiring other educators too! I have lots more to write about – namely open badges – so stayed tuned!